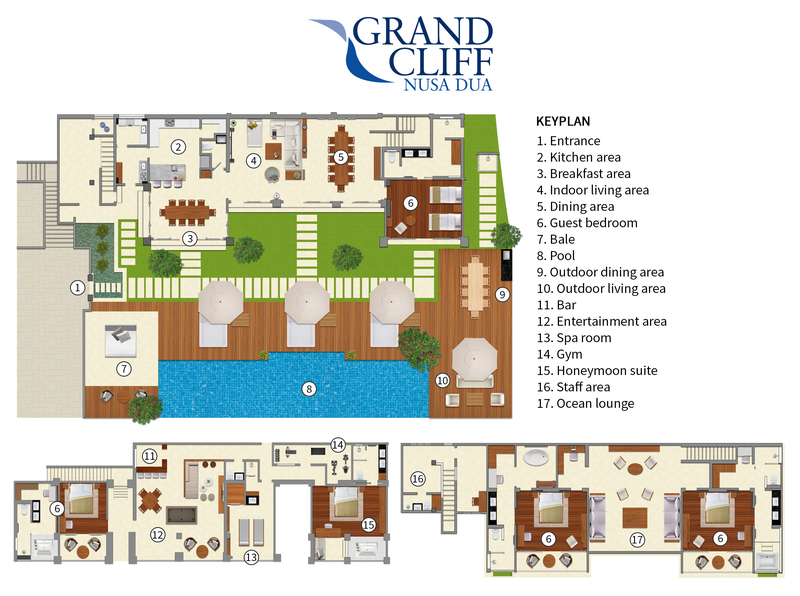 Integrated into the side of a cliff, with every room enjoying an awe-inspiring ocean view, Villa Grand Cliff Nusa Dua spans three floors. The villa is entered on the middle level, home to an expansive living/dining room and kitchen, and a twin bedroom. Outside, a cliff-edge pool and jacuzzi, a poolside relaxation pavilion and an alfresco sitting, dining and barbecue area beckon. On the upper level is another huge living room and two guest bedrooms, while the villa’s lower level comprises two more bedrooms, a games room with bar and home theatre, a spa and a gym. Entering the villa on the middle level, you’ll find yourself in an expansive air-conditioned living and dining space integrating a sunny breakfast table for 10 positioned adjacent to an immaculate guest kitchen. Hidden out of sight is a professional service kitchen. To the far side of this luxurious space is a formal 12-seater dining table and a guest washroom. The living area is furnished with a large modular sofa, and a 65-inch international-channel TV, while the provision of WiFi and an iPad allows access to music via Spotify, which can be played through ceiling speakers and poolside speakers. At the front of this room, glass doors open to the pool deck, the sea breezes and the view. On the upper floor, a huge atrium-like living space is capped with a pitched, insulated glass roof, which allows the natural light to stream in from above, while diffusing the sun’s rays. The room is furnished with chairs, coffee table and a games table as well as a pair of elevated built-in daybeds that double as extra beds if required (at extra cost). Glass doors slide open to a breezy balcony. On the lower floor is a games room and bar. To one side is a billiard table and a games table, while to the other is a cosy home theatre, furnished with comfy sofas and chairs and equipped with a 65-inch international-channel TV, a four-speaker surround-sound system, karaoke machine and Playstation 4. Bar tables and chairs extend onto the balcony. More luxurious facilities on the lower level include a wood-panelled spa room with two massage beds, a shower, and an infrared sauna for two. A well-equipped gym completes this floor. Punctuated with gnarled frangipani trees, and flanked by paved pathways and neat lawned areas, a broad timber deck wraps around three sides of the 16-metre cliff-edge infinity pool and jacuzzi. At one end is a large balé relaxation pavilion, while the other end is open to the sky and furnished with an all-weather sofa and chairs, an alfresco dining table, and a gas barbecue. Set slightly back, a pergola roof provides shelter and shade if required. All five of the generously sized bedrooms at Villa Grand Cliff Nusa Dua are blessed with glorious ocean views. All have toe-pleasing timber floors, and each is equipped with air-conditioning, a wall-mounted 43-inch international-channel TV and Blu-ray DVD player, a safe deposit box, top-class amenities and superior comforts. Four are furnished with king beds and one with twin beds. Situated on the middle level, this twin-bedded room opens directly onto the pool deck against a backdrop of the Indian Ocean. The bedroom is adjoined by a dressing area, complete with a built-in wardrobe and an ensuite bathroom fitted with twin washbasins and a rain shower with a handheld option. Positioned on the top floor, this white-walled suite is accented in shades of sea-blue to reflect the ocean waves below. It is furnished with a king bed and has an adjoining bathroom with a rain shower and a handheld option. A freestanding tub is set within its own space at the back of the room, with a window that can be opened to enjoy the view. This large top-floor suite is furnished with a king bed plus a desk and chair oriented towards the ocean panorama. An ensuite bathroom, complete with rain shower, is located behind the bedroom but who will be able to resist a scenic soak in the sunken bathtub for two, which is positioned at the front of the bedroom behind a window of one-way-vision glass? Situated on the lower-ground floor, this spacious suite is furnished with a king bed and has an adjoining bathroom with a rain shower and a handheld option. A precious feature here is the bathtub for two, which is positioned at the front of the room behind a sea-view window of one-way-vision glass to enhance your bathing experience. Wake up to the sound of the waves in the romantic Honeymoon Suite, which offers you a king-size four-poster bed and the opportunity to relish every moment of that magnificent view with the provision of a jacuzzi-tub-for-two right next to the window. Your privacy is ensured by one-way-vision glass and a blind that can be dropped after dark. This suite is located on the lower ground floor.